Welcome to Part V of the life story of Rich Buckler! 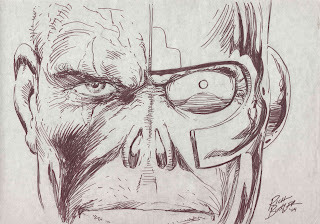 Following on from Part IV, Rich discusses the creation of one of his most famous creations, Deathlok. Keep watching this series as there's some exciting news that, once the ducks are all lined up in a row, will thrill a lot of people. There's a reason why I love keeping and reading old fanzines and the like. One of the main reasons is that they're so bloody hard to come by here in Australia, or, at least, they were. In the 1970s I kept hearing about this thing called F.O.O.M (Friends Of Ol' Marvel), but until the 1980s I'd never seen it. I was very happy to finally get the chance to start buying issues of it, along with other magazines that I'd only ever heard about, such as Amazing World Of DC, Marvelmania and several others. Well the elephant in the room is finally out in the open. Rich Johnson has just posted information about Gene Colan and his situation that a few people have been privvy to for a while now. It's worth sharing if only to warn others about the issues of male domestic violence. 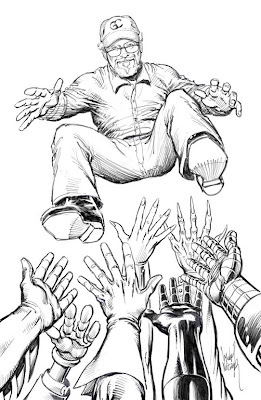 There have been a number of rumours, counter-rumours, briefings, deleted posts and whisperings regarding the state of Gene Colan, 83, his health and wealth and his property of late. This is an attempt to bring some clarity to proceedings, after speaking to a number of sources close to Gene and his associates. Last December, Gene Colan's wife Adrienne, 67, entered a mental health facility in New York after an alleged self-harming incident, but was released soon afterwards. Previously, she had run Gene Colan's business affairs but after this event both their children, Eric and Nanci, became involved in that role and took it over fully in March. Courtesy of Gerry Turnbull. The art is penciled by Neal Adams and inked by Alan Kupperberg, and was done sometime in the 1970s. 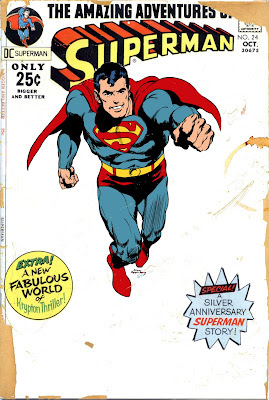 Terrific stuff and I have to say that I'm very darn happy that I finally have reached one of my art goals, owning an original Neal Adams Superman! Launched in 1989 as a stand-alone title following the huge popularity of the Tim Burton Batman movie, Batman: Legends Of The Dark Knight was initially different from mainstream Batman titles and was the first on-going Batman title to debut since the main title, batman, debuted in 1940. The concept of the title was to showcase constantly rotating creative teams, whom would work no more than five issue arcs to produce stories of graphic novel quality. Best of all the creative teams could have carte blanche as they could feature stories that were not necessarily part of current continuity, but could be considered canon in the characters history. This meant that each team could pick an era of the Batman’s career and work within that time frame and not be bound by current events in the mainstream Batman titles.